So...Here's The Thing With Saying "Gay Is The New Black"
I cannot even begin to express how frustrated I become whenever I hear someone say Gay Is The New Black. The moment I hear the phrase I tense up like I’m being put in the middle of two very angry parents having a heated debate and wanting me to pick a side. Each has valid claims but the tension between them turns into anger, and the conversation becomes accusatory. Rather than allowing me to express how each argument is right you can’t say anything because you don’t know how to convey it. You want to make both of them proud because you love them both and don’t want to disregard their feelings. There’s fear that if you agree with even the smallest point either has made that you’re betraying the other. That’s what phrases like this do. Rather than unify they become divisive. Us vs. Them. Because I’m a gay African American man, this analogy perfectly describes how I feel sometimes as a member of both communities. Instead of connecting on an emotional level it feels like each side is trying to prove they’re right. They’re both right and both have been wronged. Both have been oppressed and denied the freedoms that are a right as a citizen of this country. Both have been bullied and threatened, treated inhumanely and killed. So when phrases come up like Gay Is The New Black it adds more tension to a very frustrating and painful situation. When I see articles like this speak ad nauseum about this subject without fully addressing the gravity of such a loaded phrase and why it is problematic frustrates me. I become so overwhelmed with emotion because I understand the strife and plight surrounding them both but it feels like they’re still at odds with each other, wanting me to pick a side. Both have been ostracized and ridiculed for being who we are. Our lifestyles, music, clothes and hair. Our dances and songs. Our pain and our sorrow. We understand these words because we cultivated a way of coping and adapting our lives that is different from society. We began to dictate the way in which our story would be told. We became activists and leaders so the burdens we carry do not become the problems of future generations, We decided to live our lives unashamed and openly and love ourselves and each other no matter what. This is what the LGBT community and the African American community have in common. Yet at times each community seems to become so incensed with how we are being wronged we lose sight of the same thing happening to each other. Then phrases like Gay Is The New Black makes you pick a side. Here’s the thing…gay can’t be the new black because black is not done being black yet. Racism and discrimination did not disappear when President Obama was elected into office. I know that is why African Americans become defensive with this particular phrasing that is commonly employed by the civil rights movement of our LGBT community. The loaded phrase implies that all the struggle and pain that has happened to the African American community is over when that is not the case. If stories like Trayvon Martin are any indication, then it is very apparent that racism is still a problem in this country. Racial Profiling still exists. We saw a presidential election last year that featured both supporters and even some of those politicians running as the most hate filled, derogatory and most embarrassingly racist campaign in this nation’s history. Because you can always see color. Always. You will always know that I have African American ancestry no matter how affluent I appear to be or profession I choose to embark upon. It will always be the first thing that you see and process about me. My homosexuality, our sexuality as a community, is something that you can’t just see to be judged upon. It may be accompanied by voice, hairstyle, hair, clothes…all things that can be modified and/or changed and not always identified as gay. But you cannot do the same with race. It is always, always there. So you can attempt to mask it to an extent in order to protect yourself. Of course you are still gay and can still be discriminated against regardless of what you look like but with race it will always be about what you look like. And this is where the tension between the communities begins. Because of how differently we’re discriminated against by society, members of these two communities distance themselves further. We categorize and judge first by what we see. And the tension begins. The question between the groups first addresses homophobia in the African American community. And yes there is homophobia in the African American community. And that goes for every other race/ethnicity as well. It’s rooted in the same devices as homophobia in other races and cultures; Fear. Fear that a religion that was forced upon us and twisted so that those in power can stay in power. Fear that the association with another group being discriminated against will encourage more discrimination against our own community. Fear that the pain of our ancestors and the silent acceptance that we are judged on our skin color will be forgotten and that history will repeat itself. It feels at times the LGBT community focus on the African American community more on this subject is because in our nation’s history we are the ones that have faced centuries of prejudice and enslavement. Because we were and still are judged on something we cannot change, skin color. And there is racism in the LGBT community. When you hear phrases like “I’m gay I can’t be racist”. The insensitivity shown to African American culture that is caricatured by some as a source of entertainment has not gone unnoticed. When some still ask when a crime has been committed in this country and ask “if he’s black” then a stigma still exists. Whenever you’re telling a story about a friend and put black, Hispanic, Asian or any other race when it has nothing whatsoever to do with the story then there is still a barrier. There is a belief held in the LGBT by some that you cannot be racist if you’re gay. Like this status negates you from having prejudices. And the same fear of associating with another minority group for fear of reprisals exists in the LGBT community as well. These instances of prejudice add more tension to the discussion. Although these issues that are at a societal level, they are transfixed upon these two communities that give the appearance that they are specifically the product of either community’s beliefs. In other words prejudices that are from society are overemphasized to either community. Racism in the LGBT community. Homophobia in the African American community. They exist but are given more weight because we feel we should outright have support from each community and anything other than that is a betrayal. And our oppressors just watch as the work is being done for them. When we are at odds with each other, they don’t have to work as hard to deny us equal rights. All the time we spend deciding who has it worse hurts both our causes. Maybe I see it this way because being from both communities and it allows me to see what phrases affect how we relate to each other and our causes. I’ve talked about this dichotomy before, when you’re both an ethnic minority and a member of the LGBT community. Somehow there is this magnification of tension and frustration with each other even though we get enough of that from society. We often want to give emphasis to a cause and relate it to the past but that is not always a cohesive comparison. Even the phrasing of Gay Is The New Black almost sounds as trivial as a change in fashionable attire rather than two groups that have been wronged and persecuted. It’s irresponsible to approach this subject and make this comparison because it takes on this accusatory tone. In return it feels like the group you’re trying to relate to turns into a critiquing of their inability or unwillingness to help. It makes the receiving side feel they are somehow solely responsible for the other’s plight. The processes are not the same. Dealing with discrimination and oppression from each community is not the same. So when we talk about this issue, we need to talk about the emotion not so much the history when we try to relate the struggles of these two communities. Talk about the pain of what it feels like to be discriminated against and demonized for something we cannot change. We may be apples and oranges but are still as sweet as any fruit that needs sunlight in order to grow. Gay is gay. Black is Black. Both are different but equally beautiful. Where Are We, The LGBTQIA, Today? I agree totally. BUT being a gay man, I tense up and get upset when black activist get upset about gay rights being a civil rights issue. No one owns the civil rights movement. 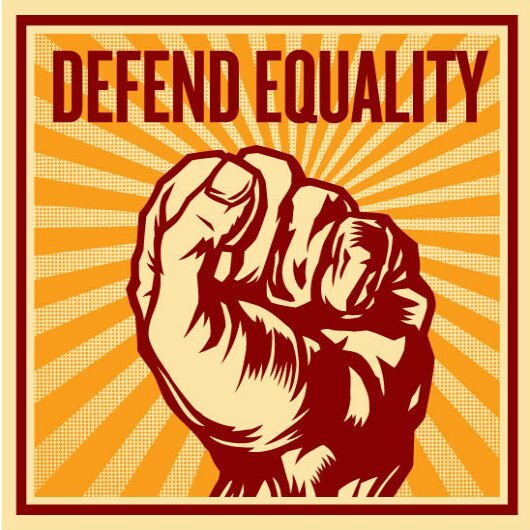 Equality is Equality and Civil Rights is Civil Rights no matter what your race, gender or creed. There should be no comparison to eack other. We should all be working together for everyone. Black is genetic. There is no comparison. Homosexuality is a choice. WAKE UP ! Why promote equality for a behavior! Homosexuality is a behavior. It is not genetic. You have choice here. Stop being a homosexual. Other have and you should. Its not natural. It isnt supported in the evolutionary chain. Sigh. Just sigh. That’s all the effort I’m going to give trolls like this.